This post originally appeared on the Practicum: Critical Theory, Religion, and Pedagogy blog. This summer I taught a class on Religion and Film, and I feel as though I had to reinvent the wheel. This was my first time teaching Religion and Film and I was shocked by the state of scholarship on the topic when I began constructing my syllabus. From the perspective of ideological critique, the area of study is rife with essentialism and is about twenty years behind current trends in continental theory. There are a few great books in print, such as Michael Ryan and Douglas Kellner’s Camera Politica: The Politics and Ideology of Contemporary Hollywood Film, M. Gail Hamner’s Imaging Religion in Film: The Politics of Nostalgia, and Gregory J. Watkins, Teaching Religion and Film, but many of the books on the subject imagine religion in essentialist terms. The dominant paradigm used in the field is to treat “Film as Religion,” which boils down to a mythological analysis of film. According to this perspective, film functions like a religion because it is a cultural projection of the deepest human values and beliefs onto the silver screen. Film is portrayed as a social glue that constructs symbolic universes of meaning. In his popular book on the subject, Film as Religion: Myths, Ritual, and Rituals, John C. Lyden uses this paradigm to develop “a method for understanding film as performing a religious function” (3). Building upon the work of Clifford Geertz, Lyden defines religion as “a ‘myth’ or story that conveys a worldview,” and suggests that films express these myths by using all the tricks of cinematography (4). Lyden uses this definition to explore how the artificial nature of filmic reality has the power to affect us religiously in the modern world. Another popular book on the subject, which is used as a textbook in many courses, is Joel Martin’s and Conrad E. Ostwalt’s, Screening the Sacred: Religion, Myth, And Ideology In Popular American Film. Like Lyden, the editors of this book also privilege mythological readings of film and devalue ideological analysis. The text is superior to the former book because it offers examples of theological, mythological, and ideological film criticism, but the editors repeatedly suggest that ideological criticism lacks the depth of theological and mythological perspectives. Moreover, the editors openly state their desire to study religion in film in order to uncover its essential qualities. As they write, the aim of the study is “to take the things of the spirit spiritually” (12). The editors make the apt point that religion can’t just be rejected as the “opiate of the people, a mystifying set of symbols and ideas,” yet their correction to this error is to essentialize religion as an autonomous domain of culture (11). Given the state of scholarship on the topic I decided to construct my Religion and Film course as a critique of the “Film as Religion” paradigm. Instead of privileging theological and mythological criticism, or simply inverting this model and privileging ideological criticism over the former two, I treat “Religion as Film,” and interrogate how films present religion on a symbolic and technical level. This means that rather than looking for the “religious power” in film as Lyden, or taking the things of the “spirit spiritually,” as Martin and Ostwalt, I present religion as a modern cinematic creation without essence or origin. The fundamental thesis of my course is that religion is not a thing with definite qualities but a symbolic and technical production of popular culture. Religions are often portrayed as static and insular traditions that stand in opposition to (or in conflict with) popular culture, but my course explores how films challenge this perception by creating, mimicking, and influencing our understanding of religion. Following the lead of Gail M. Hamner in her syllabus on the topic, I treat religion as an “occasion for analysis,” not an “object of analysis.” The films I screen in class and the readings I give students do refer to Christianity, Buddhism, Islam, indigenous traditions, and new religious movements, but I do not use any as authoritative presentations of religion. Rather, I present the films and the readings as attempts to frame the relationship between reality, symbols, and society. Since there are no textbooks that expose “Religion as Film,” I have used Martin’s and Ostwalt’s Screening the Sacred, but juxtaposed this text to alternate forms of criticism and analysis from film studies. First, rather than simply screen the films and readings from Screening the Sacred in a chronological order, I have mixed things up by showing how the types of criticism the editors select in this volume are not mutually exclusive. Whereas Screening the Sacred is divided into three neat sections, each of which provide a different type of criticism – theological, mythological, and ideological – I blur the distinction between these forms of analysis by providing students with competing theoretical articles, and inviting them to make up their own minds about what type of criticism is most dominant. Second, each week I also supply students with readings from Timothy Corrigan’s, The Film Experience and Louis Giannetti’s, Understanding Movies. These readings provide the technical terms from film studies that are necessary to understand how film images are created by directors, cinematographers, writers, actors, cameras, lighting, make-up, costume, etc. For instance, on week two we watched Oliver Stone’s first Vietnam War flick Platoon (1986), and read a wonderful essay from Screening the Sacred on how the entire film functions as a New Testament allegory. According to a theological reading, Platoon offers a critique of the American war effort by making stark claims about absolute good and evil, and providing a narrative of redemption in Christological form. However, in addition to this theological reading, the students also read an essay that offers an ideological critique of the film. According to this second reading, Platoon reinforces the American War effort by obscuring deeper political considerations and sustaining various myths associated with American nationalism. Of course, the point of this juxtaposition of critical readings is not simply to show how multiple interpretations are possible – a point most undergrads already accept – but to get the students to notice what technical aspects of the films these differing arguments rely upon. 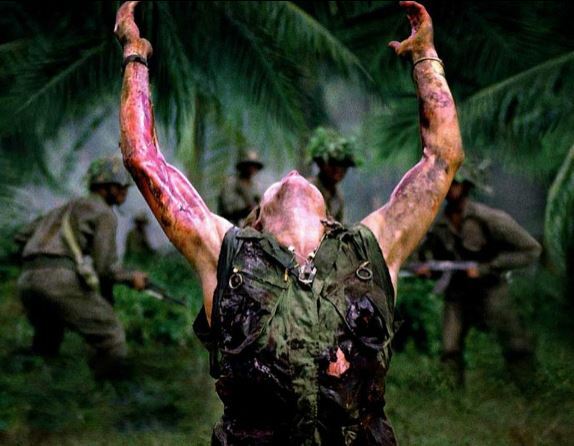 It is obvious that a film such as Platoon can lend itself to multiple readings, but what are the cinematic elements that support these various perspectives? What sort of cinematic style does the director use to get his point across; realism, formalism, or classicism? How does the plot and character development use religious ideas to facilitate this cinematic style? How about Symbolism and imagery, is it used to endorse or critique religion? Moreover, what about the use of dialogue and monologue, who is telling this story? Is there an omniscient narrator, narrative, or theme, or are all the characters subject to the whim of chance? What is the tone of the film and how do all the special affects support this tone? And, perhaps most importantly, what about music, lighting, makeup, costume design, etc.? How do all these technical factors combine in the mis en scene of each camera shot? How does each image frame religion as something to be observed, felt, or critiqued? Hence, I use the types of criticism in Screening the Sacred in conjunction with critical analysis from film studies to expose how religion is presented through film, not as a guide for uncovering the religious essence in film. Fundamentally, what interests me is what films do with ideas and images, not defining religion in any particular way. At no point in the class do I provide a strict definition of religion. Rather, I invite students to examine how the films and the readings tell us to think, feel, and imagine religious content. What I continually ask everyone to consider is how religion is talked about in film, and to explore all the intellectual assumptions and technical aspects that go into the creation of images and effects on the silver screen. In a sense, what I ask them to consider is how everything we think we know about religion is created by filmic reality. By reversing the paradigm of “Film as Religion” with that of “Religion as Film,” I invite students to consider how cinematic production creates the very content of religion in popular culture. This entry was posted in Pedagogy, Tenzan Eaghll, Theory and Method, Uncategorized and tagged and Pedagogy, Clifford Geertz, Conrad E. Ostwalt, Critical Theory, Douglas Kellner, Gregory J. Watkins, Joel Martin, John C. Lyden, Louis Giannetti, M. Gail Hamner, Michael Ryan, Oliver Stone, Platoon, Religion, Timothy Corrigan. Bookmark the permalink. This sounds like an awesome course! I would love to see the syllabus (since I can’t take the class 😉 ). Agreed, this sounds like an great course. Would you be able to share the syllabus or module outline? The two example you mention are outdated, considering the rapid changes within the field. You also leave out the importance of scholar Melaine J. Wright’s (1970-2011) contribution to the field. After all, except for being a brilliant scholar, she wrote one of the more well known introduction books in the field (“Religion and Film: An Introduction” I.B. Tauris 2006), pointing out the same failures of earlier scholars as you mention here. Other prominent scholars have also raised theses questions – William Blizek, Robert K. Johnston and Gordon Lynch. In other words, I don’t see this “dominant paradigm” you’re talking about. On the contrary, the field of religion and film studies is in constant development and keep finding new and exiting ways to merge with other disciplines such as sociology anthropology, psychology, and off course, in more complex ways with film theory. Regarding the work of William Blizek, I did have an essay by him in the first week. The work of Robert K. Johnston, on the other hand, is a perfect example of the dominance of this paradigm. Before I answer, I just want to make clear that my critique was not about your syllabus or future course (I think it sounds awesome, btw). What I was critical about was only the way you described the current situation within the broad field of religion and film studies and how you argued that the trend represented by Lyden, Martin and Oswlat was somehow “dominating”. Rather I would say there are some perspectives which have been reoccurring, but there has never been any real consensus (or paradigm) within the field since the approaches are so many and appearing form so many different directions (new media studies, film studies, visual anthropology, post colonial studies, psychoanalysis etc). And many of those who choose to do studies which could be included in the field of religion and film studies are very often doing so to try out something different or new within their own field. One could say that the the field of Religion and film studies has partly come about because of people trying new perspectives or new material of analysis. Concerning Wright, I don’t agree with your description of her study. In her book she looks at narrative, style, cultural and religious context and reception. And as far as religion is discussed as a producing element, it is rather within the context of how religion is used, created and negotiated with (see for instance her chapter on “Wicker Man” and its relation to Frazer’s The Golden Bough). Also, I think it is unfair to say that her book focuses exclusively on Christian films. There are two chapters out of six which focus on christian topics (“Keeping the Faith” portrays Catholicism, but also Judaism). Besides the book Wright has also written a very interesting chapter on culture studies in “The Bloomsbury Companion to Religion and Film” which I can highly recommend. Finally, the reason i choose to mention Robert K. Johnston (and also Gordon Lynch) was because of the his (ed.) anthology “Reframing Theology and Film: New Focus for an Emerging Discipline” (2007 Baker Academic). oops… I didn’t reply directly to your comment. See the post just below this for my response. I am sticking by my assertion that there is a “dominant paradigm” in religion and film studies. As I suggested, I think this dominant paradigm is basically mythic: people tend to look at religion in relation to gods, archetypal structures, or metanarratives, and this tends to boil down to looking for mythic structures in film (in one form or another). Once you go into the broader field of film studies there is lots of diversity and technical analysis out there that is really great, and I draw upon these essays in my syllabus, but this technical analysis seems to be largely absence from the big books on the market in religion and film.